Greetings from New Saint Andrews College. Our first term here (Jerusalem Term) has come to an end already after a productive flurry of papers, written exams, and oral exams. In September, while classes were in full swing, we were pleased to have our Conservatory of Music host Belgian Pianist Gilbert De Greeve who gave two lectures, a master class, and a fantastic recital featuring Debussy’s 24 Preludes. This week our students are taking a much-needed break from their joyful, but rigorous academic work here. Meanwhile, I have been traveling extensively on behalf of the college. Thank you for praying for guidance, safety, and blessings for travel as I represented the college as far away as Seoul, Korea. It was indeed a blessing to interact with the leadership of two classical, Christian high schools in Korea and to observe their fervent pursuit of godly education for the next generation. 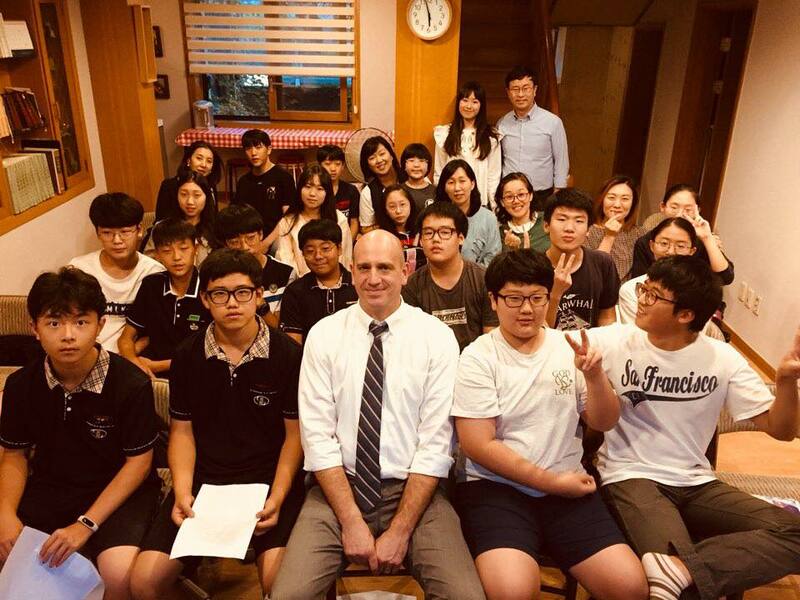 I enjoyed meeting and fellowshipping with the families of two of NSA’s students who hail from Korea, and our college looks forward with anticipation to continuing this educational relationship in the future. David Koyzis, Fellow in Politics at the St. George’s Centre for Biblical and Public Theology, will be speaking and playing classical guitar at our first Disputatio of the new Nicea Term on October 19. Also, that same evening, join us for NSA Music Night on October at 7:00 pm at the home of Matt and Renae Myer to hear NSA students and other local musicians perform in a social setting. On Sunday, November 11 at 3:00 pm Collegium Musicum, the NSA Orchestra, and a recorder consort will be performing Sing and Play unto the Lord. This concert will take place at First Presbyterian Church here in Moscow. We are looking forward to our first-ever Christmas Feast Concert Celebration at 6:00 pm on December 1. This will be a concert and a dinner in the tradition of the boar’s head feast. It is a ticketed event with details forthcoming. The venue is the yet-unremodeled Cadillac Jack’s. We welcome high school seniors to visit classes and activities; one of the best times to do that is during a prospective student weekend, which is particularly geared to address the questions of prospective students who want to find out more about college life at NSA. Our next upcoming weekend is October 26-27. For more information and to register, see our admissions page at https://www.nsa.edu/admissions/visit-nsa/. Our annual spring President’s Dinner is on the calendar for May 8, 2019. This is a great evening to spend with faculty, staff, board members, and friends of the college. Not only is there a fabulous dinner prepared by Mark Cuneo and paired with wines crafted by Gino Cuneo, but it is also a fundraiser which benefits the college.